Hello Samurai of the Spider Clan! His Imperial Majesty has tasked me with distributing these offerings for your enjoyment. And what a marvelous monster he is, Daigotsu's Clone-son. 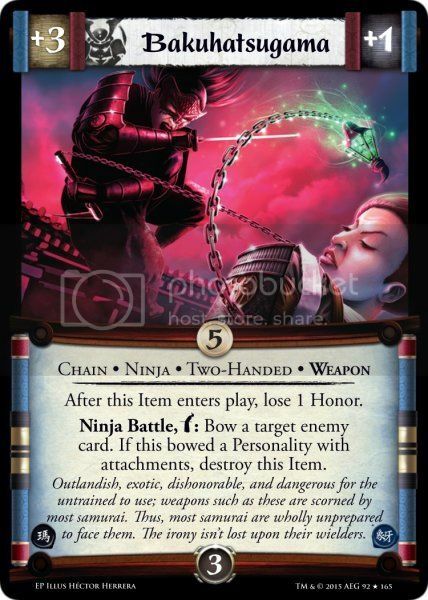 The Ninja are decent to good, the Duelist is great for a boxable, given he can leap to 4c, Goju Sensei dodges the dreaded -1G and has potential. All in all, these are some decent previews. Last edited by CrimsonEyes on Wed Sep 09, 2015 11:03 am, edited 1 time in total. also Aimaro is pretty solid. he's telegraphy, but you can't argue with that stat line. 4 for 3 chi, 4 chi after a battle action. dang son. welcome to my dueling deck. HOLY CRAP THAT SENSEI LOOKS AWESOME! Also that Daigotsu looks scary as all else and YUHMI! We need a few more duels and I think this can be bonkers! 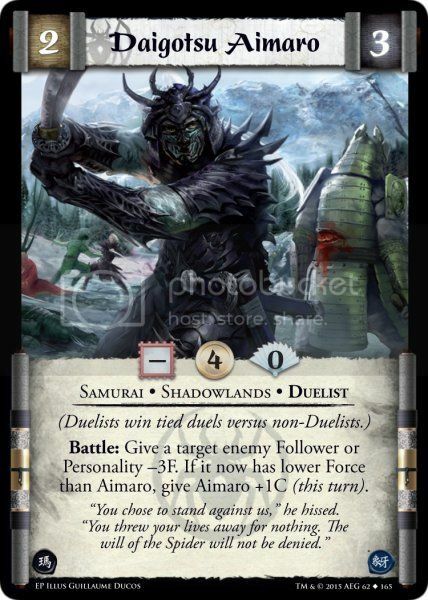 Any new duels will likely be shown with the Crane or Dragon previews since it's basically what we do. Goju Sensei gives the Ninja deck some serious legs, especially given how much kicker we have from hitting blanks with our Ninja. It almost makes up for the complete poo that was Kuroko Sensei. And Aimaro is rock-solid for a boxable, much less one with a -3f jab, that works well with the other things Spider wants to do (Fear and Force Duel, so far). Honestly, he's worth consideration solely as a boxable with an ability, even outside of strict Spider duelers. 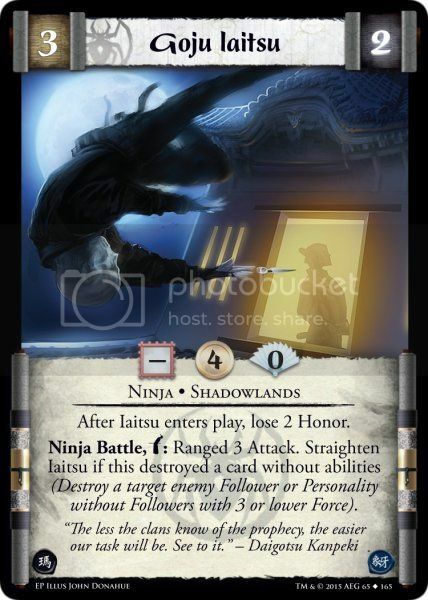 Iatsu's a boxable with a Ranged 3, which could see some consideration outside of pure Ninja, though he's immeasurably better in there, as you'll proc his kicker more. Toriken is Onichi-lite. No Cavalry or Shugenja, but Conquerer, and both remove an ability. Is as close as we'll ever get to our Ninja-Horse in lower-power Ivory. Last edited by CrimsonEyes on Wed Sep 09, 2015 11:15 am, edited 2 times in total. Goju Sensei gives the Ninja deck some serious legs, especially given how much kicker we have from hitting blanks with our Ninja. And Aimaro is rock-solid for a boxable, much less one with a -3f jab, that works well with the other things Spider wants to do (Fear and Force Duel, so far). Honestly, he's worth consideration solely as a boxable with an ability, even outside of strict Spider duelers. Just looking at these, and my head's going 'Spider is going to be STRONG in Draft'. 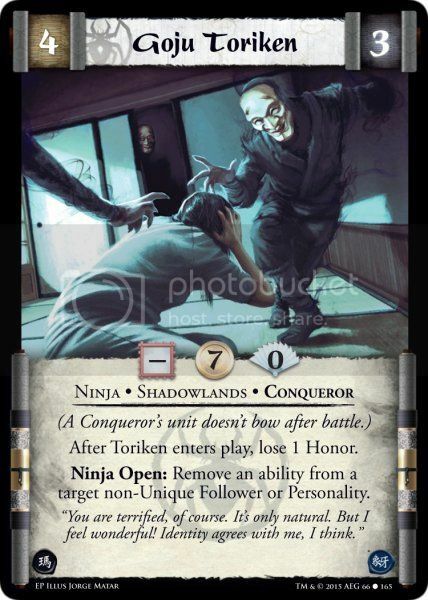 4F for 7G Conqueror who strips an ability from an enemy card as an Open? Sounds okay. Common? So, you mean, if I am drafting Spider, I could be swimming in these guys? Add to that an uncommon with a Force debuff and another with a Ranged attack. And another Common at the 7G price point, for 5F. 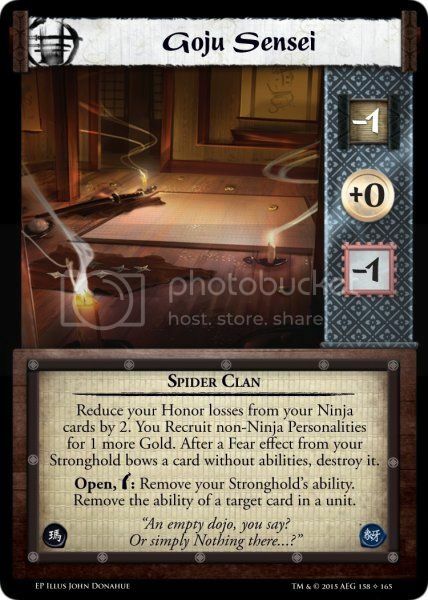 Shinsei's Last Hope is going to be a rough card to deal with in draft for Spider, but luckily? It's rare. FREAKING YEAH! Spider in draft has some powerhouses. Hell the sensei alone is enough to consider spider. Looks like the Master of Earth is gonna be nicknamed "lefty." The art, man, the art... SO. GOOD. Oh, and I guess the cards are better than decent, too. The Sensei is not playable in Draft because Premium cards cannot be drafted. Also, I'm surprised that nobody's commented that you guys are getting another Unique in the rare slot. 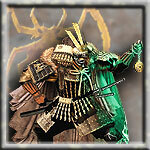 Endo, Hikayo, Master Infiltrator, Unshackled, Without Your Weapons & Phalanx Formation can be found at the link. 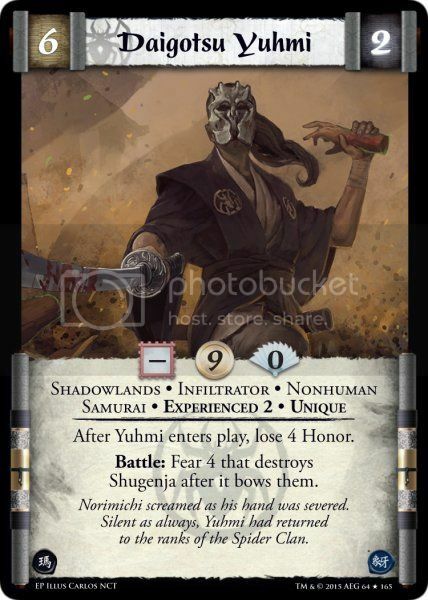 I WISH that Sensei was playable in Draft. It would be insane! On the bright side, reading that Sensei? It says "Remove your Stronghold's ability", singular, nor plural. Meaning that you only have to remove the Dynasty ability to use it, which I did not catch on my first reading. Which makes that Sensei even more flexibly awesome. I, for one, like getting our Uniques in the Rare slot, especially when we have powerhouses in the Common and Uncommon. Your getting your wish to remove the council! I'm so happy for you! It might also be a hint for our next box which might only have one ability, because losing the dynasty action is no cost for those first few battles. Ninja Training Exercise is fun. More Bodies is good i hear. We're getting a lot of shug hate, which is interesting. but the real winner is Betrayed from Within. 10g open kill. DANG SON. Clan-aligned ogres are back, Yuhmi is back, and the cards' flavour feels like the ones of the early days of the Spider. I approve! The only issue I have is that most of our new Personalities don't look like as though they work for regular Story Prizes. But I won't worry about it until it actually turns out to become a problem. I miss courtly characters, but with Shibatsu, Takuan, Kuroko or Yunmen, Naishi and other WC characters, we have plenty to choose from. You guys are thinking of the Ivory stronghold. Hidden Bastion only has one ability; the Dynasty refilling thing is a trait now.